It's Inspector Maigret Day over at Patti Abbott's blog, PATTINASE. 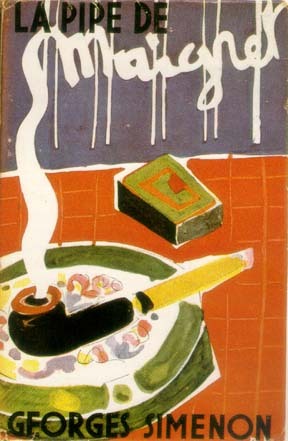 (Actually, it's Georges Simenon Day, but to me that means Maigret, though I realize now that Simenon wrote a lot of other good stuff too.) I decided not to write about the commisairre of the Paris Brigade Criminelle made famous by his creator, the very prolific, Georges Simenon, simply because I couldn't remember the why or the how or the what of the books I'd read and loved years ago. I was introduced to Maigret in MAIGRET'S CHRISTMAS, an anthology of 9 Maigret short stories not to be missed. (That much I do remember.) Then I read MAIGRET AND THE MADWOMAN, MAIGRET AND THE WINE MERCHANT and MAIGRET SETS A TRAP. But here's the thing, I can't really say much about them except, I know I loved these stories set in Paris and I was very much taken with Maigret and his indefatigable wife. Other than that, my memory refuses to cooperate. And short of re-reading everything and taking copious notes- something I might do one of these days - I simply demurred. But don't you forget to check in at Patti's and see what other bloggers with better memories are saying about Maigret and his creator. Now this is a book cover I can relate to. It's excellent. Now why can't today's covers be more like this? I read Maigret and the Yellow Dog last year, my first venture with Simenon. I liked it and will read more. By the way, there is a set of -- I guess -- TV episodes starring this French detective. I got them from the library and enjoyed them. This might be a poster, Kathy. But yes, I love the artwork. No artist info, though. I need to see the TV show you're talking about, I know the one you mean. Somehow I missed it. That's the link to the British TV series with 12 episodes featuring Inspector Maigret. In English, obviously, which I appreciate since reading subtitles is not my thing these days. Have you watched the series of Maigret on Netflix?